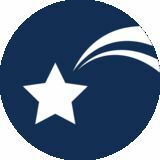 Kofax Capture INCREASE DOCUMENT AND INFORMATION VISIBILITY Kofax Capture™ is a powerful document capture platform that productively, consistently and securely processes all types of documents and information from virtually any source and location. 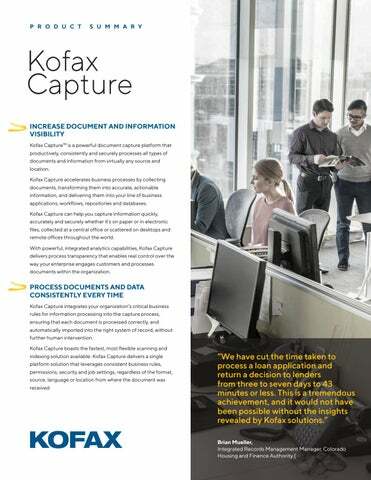 Kofax Capture accelerates business processes by collecting documents, transforming them into accurate, actionable information, and delivering them into your line of business applications, workflows, repositories and databases. Kofax Capture can help you capture information quickly, accurately and securely whether it’s on paper or in electronic files, collected at a central office or scattered on desktops and remote offices throughout the world. With powerful, integrated analytics capabilities, Kofax Capture delivers process transparency that enables real control over the way your enterprise engages customers and processes documents within the organization. PROCESS DOCUMENTS AND DATA CONSISTENTLY EVERY TIME Kofax Capture integrates your organization’s critical business rules for information processing into the capture process, ensuring that each document is processed correctly, and automatically imported into the right system of record, without further human intervention. Kofax Capture boasts the fastest, most flexible scanning and indexing solution available. Kofax Capture delivers a single platform solution that leverages consistent business rules, permissions, security and job settings, regardless of the format, source, language or location from where the document was received. For data capture, the solution extracts important information such as machine printed text, bar codes, hand printed words and even checked boxes. and your organization benefits from reliable, accessible, processready data and documents. Add secure capture channels like email, web applications, MFPs or mobile devices, or automated document classification, separation and extraction, to reduce process latency and increase productivity, all from the same system. From hundreds to millions of documents per day, the solution can capture it all. controls already built into your capture solution. data export to a wide range of ECM, ERP, BPM and workflow solutions. It uses standard release scripts to connect seamlessly to business systems from IBM®, Oracle®, Microsoft®, OpenText®, Hyland®, Pega® and many others, automating simple and complex data transfer processes. The solution can also export to any ODBC-compatible database or to a delimited ASCII file. This flexibility makes Kofax Capture the standard front end for any system. extracted, and then exported by Kofax Capture to your back-end systems of record with complete control and minimal or no manual intervention. UPGRADE WITH COGNITIVE DOCUMENT AUTOMATION TO INCREASE PRODUCTIVITY AND REDUCE COST Kofax Capture is a highly scalable platform with a number of system upgrades, including cognitive document automation with Kofax Transformation™. Reduce time spent pre-sorting forms with automated document classification and separation. Further increase productivity with automated data extraction to speed information processing, reduce errors and deliver more accurate information to back-end systems. With features like autoregistration, zonal image pre-processing, background removal, and automatic check box thresholding, cognitive document automation capabilities extend your solution beyond capture-toarchive and simple indexing applications to higher value and more complex capture-to-process applications. Capture documents at the point of origination from anywhere within the enterprise. TAKE CONTROL OF YOUR OPERATIONS WITH MEANINGFUL INFORMATION AND INSIGHT With integrated analytics, Kofax Capture and Kofax Transformation customers can clearly see how, when and where operations are most and least efficient down to the system user, document and index field. Identify the most popular and most efficient collaboration channels. Identify and adapt the forms that result in the most errors and friction with external stakeholders like customers and suppliers. Get actionable information to reduce or eliminate friction, increase productivity and improve customer engagement. kofax.com ÂŠ 2019 Kofax. Kofax and the Kofax logo are trademarks of Kofax, registered in the United States and/or other countries. All other trademarks are the property of their respective owners.